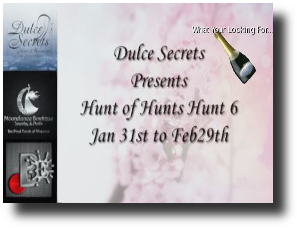 The 6th Annual Hunt of Hunts Hunt is going on now at Dulce Secrets. This is a hunt not to be missed. With lots of items for women, and a few unisex and guy specific things as well, it is worth it to grab some friends and come on down. It isn't a very taxing hunt, the bottles to find are fairly large, and aren't hidden in a tricky fashion.